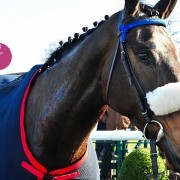 After multiple entries and withdrawals Whiskey Chaser (Frodo) finally got his second outing on Boxing Day at Towcester. Unfortunately I wasn’t able to make the trip due to festive family commitments and it was disappointing for me not to be at the course to cheer him on. Nevertheless, judging by the comments from our racing manager about the negative experiences of the syndicate owners who did make it to Towcester it’s probably just as well I didn’t go. I wasn’t too concerned about missing out on the action as I reasoned that surely at least one of the many sky sports channels would be screening the race live? Boxing day racing is one of the highlights of the year with meetings aplenty and lots of racing on the telly. At The Races (ATR) is the free to air service from Sky and they do a good job covering most action in the UK and Ireland, even split screening races when they overlap. As Frodo’s 3:40 race time approached ATR decided it would be a good time to enter an extended commercial break. This left me frantically logging into my Paddy Power online account to access their live stream. Although the stream is free to customers who have placed a bet on the race the quality was extremely poor. It felt like I was watching a very earlier Pathé Newsreel in a smokey cinema wearing dark glasses. I could just about pick out Frodo in the jumble of pixelated runners and he seemed to be going well. He was nestled neatly in second place by jockey Adrian Lane. The camera angles at Towcester and poor quality steaming made it difficult to judge his running but he was clearly up in the front group. The race was over two miles and as the furlongs whizzed past I began to sense he was in with a great chance of landing a place. No sooner had that thought crossed my mind when a strange blurred shape tumbled from one of the horses. 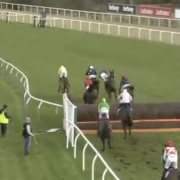 Surely the jockey hadn’t come off in a flat bumper race? Which horse did he part company with? 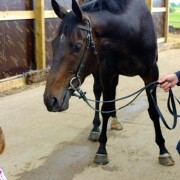 And then the sinking feeling as I realised it was our jockey! At first I thought Frodo had jinked Adrian off, but on the replay you can clearly see Frodo’s rear leg slip out. 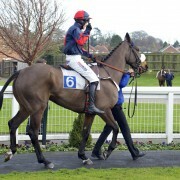 After the race the jockey reported that Frodo had unfortunately found a hole in the track which caused him to slip. Not quite as dramatic as Devon Loch’s in the Grand National but equally as unexpected. Reportedly Devon Loch’s owner, the Queen Mother remarked ‘That’s Racing’ when witnessing her horses slip yards from the Aintree finish line in 1956, my language was a little more colourful! 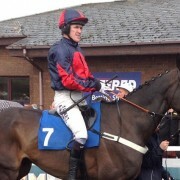 Ultimately it was a very disappointing second race, yet positives can still be taken away from his latest outing. Frodo was in the thick of the action before the slip and Adrian Lane fully expected him to finish in second place. I thought he was slowing down towards the end but I expected him to hold onto third. However, my view of the race wasn’t the best and I’ll defer to the experience of the jockey onboard or off board as it turned out. It’s safe to say Frodo isn’t built for speed, yet it was encouraging to see him keeping up with the faster runners in a bumper. 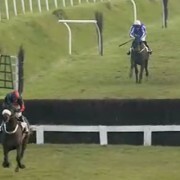 Most importantly the slip didn’t injure him or the jockey, which was my biggest concern at the time. 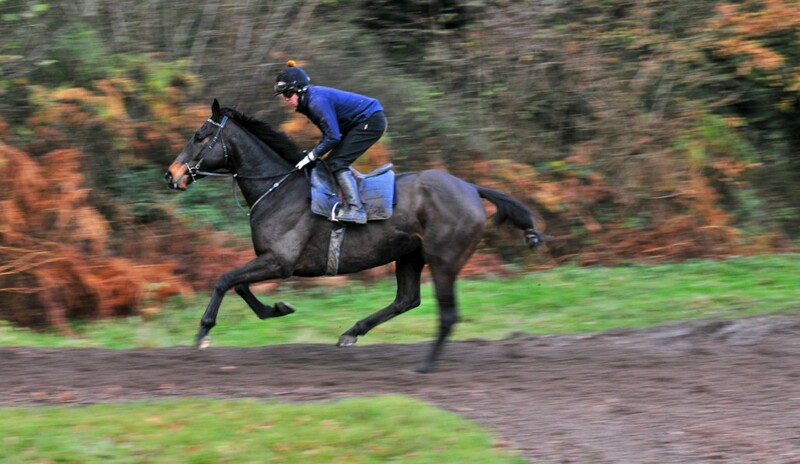 The team at Bank House Stables are said to be pleased with his run and are now schooling him with a hurdle race being talked about for sometime in January. Let’s hope he has better luck in the new year – after all, 2014 is the Chinese year of the horse.